THURSDAY morning is the best morning of the week for me. That's the time when I pop down to the newsagent down the street and pick up the local paper. I flick through it quickly in the store, take it home and devour it at a more leisurely pace as I eat my Cornflakes. Like the Sunday papers, the local paper has always been an important, habitual part of my adult life. It's also interesting to see what your neighbours and people you know are up to - are they planning work on their home, have they been up in court for something or are they up in arms about some proposal or the other? Also, of course, there's the public service the local paper provides - keeping you in the frame over what the local council and businesses are planning and letting you know the latest in BMDs (births, deaths and marriages). And then there's the chance to pick up a veritable local bargain from the array of classified and display adverts. But now this valuable source of local news, entertainment, buys and services is under threat as never before. Indeed it should - we need a thriving local Press, it is as much a part of the local community as the local police bobby or the library or town hall. In the 1960s our local railways suffered a similar nightmare of decimation - with local branch lines and service lost for good after the report of axeman in chief, Dr Richard Beeching. Beeching recommended the cuts to 'streamline' local services but the inevitable result was that there were no services left to streamline after his savagery was implemented. It should do - similar cuts are now being suggested, and implemented, at local level in the world of newspapers. This is something we should fight against. 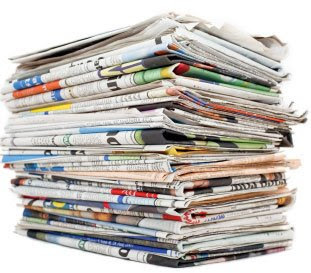 Essentially, because classified advertising is migrating to the internet - but also because local councils are sticking the boot in by suddenly producing their own freesheets on 'cost efficiency' grounds. How are they 'cost efficient'? Well, simple really - their existence means there is no need to spend money supporting local papers, because the jobs and council ads now appear exclusively in their own freesheets. The council freesheets are invariably dull, poorly produced and full of puffs about how good a job the local council is doing. They are in no way viable substitutes for the local papers they are replacing and helping sentence to a slow, painful death. 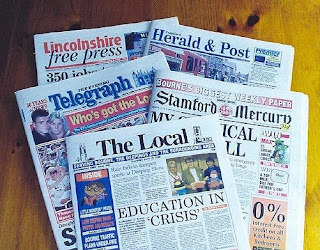 So what can we do about it...how can we help our valuable local papers survive? We can keep buying them, of course - but that in itself may not be enough. We can demand of our local councils that they divert their adverts out of their freesheet and back into the local papers. And we can demand of the Government that they divert some of the astonishing sums of money we plough into the BBC towards helping the survival of local papers. They do, after all, provide a more important service to the normal man and woman in the street than say some avant-garde, little-listened radio station or some so-called worthy cause string of programmes on BBC4. We need to lobby our local MPs and councils - and ask them for their help. Subsidies and advertising returned to its rightful place may be the key to survival. Otherwise, Thursday mornings will one day hold a less special affection in my heart. Many thanks for your wise words here,mr Frank Worrall.Local newspapers are more than just a tradition in Britain, these newspapers are our culture and heritage. Let's not lose them to so called progress.